Batwing #1 introduces the latest addition to the Batfamily, bringing one of Batman, Inc.’s franchisees into the new DCU. But just who is Batwing, really? Previously, in the old DC Universe: Bruce Wayne decided that Gotham needed to stop hogging all the Batpeople, so he decided to practice the ancient business art of franchising. 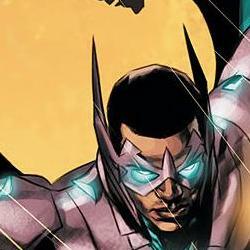 Batwing, briefly introduced in Batman, Inc. #5 and bat-franchisee from the Democratic Republic of Congo, has made the cut after Flashpoint. Judd Winick hits the ground running in Batwing #1, opening with a bloody melee between Batwing and his antagonist Massacre, a machete-wielding, skull-wearing maniac. Massacre seems to want to machete a bus to death, for whatever reason. Flashback to six weeks previous, when Batwing beats on a drug lord, hangs out with Batman and coaxes a little police work on the side. Oh yeah, and discovers a bunch of dismembered bodies that Massacre is responsible for. So it looks like the first arc will be how Batwing gets from a few piles of corpses to playing patty-cake with the very creepy-looking Massacre. Ben Oliver’s art is very slick, and pairs well with Brian Reber’s colors. The panel layout is edgy and nontraditional, matching the energetic pace of the story. As he makes abundantly clear from the backup interview, Oliver is extremely jazzed about illustrating Batwing’s armor, which he does with aplomb, but sometimes the art is a little too clean and lacking in detail for my tastes. Oliver doesn’t shy away from depicting some rather brutal violence, which gives the massacre scenes some real punch. The art is a real strength, complimenting the story well. When I first read the solicitations for Batwing, I was worried that it might be somewhat exploitative. This issue literally piles on the bodies, and emphasizes the corruption and violence that plagues the real-life DRC, but also adds a little flavor by introducing an early African superhero group that promises to be key to the story. Hopefully, Winick will be able to interestingly flesh out that backstory and create his own African mythology in the new DCU, balancing out some of the negativity. This is a solid introductory issue, but it doesn’t knock it out of the park. I’m interested enough to follow Batwing for a few issues to see if it can grow. 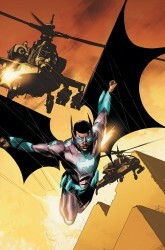 I think the book will succeed based on whether Winick can invest the Batwing character with something more than ‘African Batman with a jetpack.’ I don’t have any feel for Zavimbe’s motivations or uniqueness, but to Winick’s credit, we’ve got an archvillain, a mystery, and enough plot to chew over for a few months. The pieces are in place, now Winick just has to put them together. He’s got an art team that can provide what he needs and a very scary villain in Massacre. All Batwing #1 needs more of is Batwing. MAJOR SPOILER QUESTION: If we have a character named Batwing, is a character named Batcycle far behind? yeah, but no one calls him the North American Batman, and we DO have the entire Batfamily. Massacre reminded me of Moon Knight’s old foe Bushmaster a bit too much… Maybe it’s just me. No, I got that same vibe too. Massacre has a cooler skull mask though. This was a pleasant surprise when I opened the book, and the interior art was BETTER than the cover! What a fantastic switcheroo! I liked the story, but I kept accidently skipping pages for some reason, which kept ruining all the reveals. VERY interested to see where this goes. Once this book really finds its footing, I think it will be amazing, but eventually unappreciated by mainstream audiences. I posted this on Matthew’s review of Animal Man a bit ago, but did anyone else notice the person wearing the hood with the pinkish hue behind her head on page 17 of Batwing? The same person (I think female) is in Animal Man as well on the page where his eyes are bleeding. In both books, the person is in the background with their hood up and that same pinkish hue is there with them. I didn’t see her(?) anywhere in Batgirl #1 and I haven’t looked through JLA or Action Comics #1 either. I think something might be going on that they’re teasing for those who pick up a lot of these 52. Woman with the hood is on page 22 of Detective Comics in the crowd scene. It’s the hooded lady from Flashpoint #5. She’s in all 52 books. I think she’s teasing whatever DC’s big event will be. Hopefully it’ll be confined to Justice League, but she isn’t confined, so I can’t imagine the story will be. The hooded figure must be showing up in all of the titles because they were in Static Shock and JLI, too. Didn’t notice her in Resurrection Man. Too busy enjoying his return.